IIM Amritsar successfully organized its maiden guest lecture for the session 2018-19 and was delighted to welcome its first set of speakers- Mr. Jinesh Jain (Program Manager) and Mr. Amit Godkar (Dy Manager HR) from Capgemini. The speakers delivered an insightful lecture on the topic ‘Digital Transformation on Consumer Business’. The session saw an enthusiastic participation from both the batches- PGP03 as well as the newly joined PGP04 which is the fourth batch of the institute. The session was initiated by Mr. Amit Godkar (Dy Manager HR) who enlightened the students about the inception as well as the 50-year long journey of Capgemini, a Paris-based organization started in the year 1967, which managed to penetrate the US markets with an acquisition of iGATE. Ever since then, this Business Applications services giant has not looked back and has scaled greater heights with now a presence in 40 countries, people working from 120 nationalities and revenues soaring up to 12.8 billion euros. With innovation at the heart of its business processes, Capgemini is now a revered name in the field of consultancy, technology & outsourcing solutions. The organizational culture of Capgemini, Mr. Godkar emphasized, fosters multi-cultural diversity, global thinking, out-of-the-box problem solving, continuous learning, growth excellence, innovation, ownership, passion, collaboration and social responsibility which gives attractive incentives for the fresh talent to join. The seven core values of Capgemini- Honesty, Boldness, Trust, Team Spirit, Freedom, Modesty & Fun make it a wonderful workplace. These founding values of the company are even commended and recognized in the global platform by being given the title of- ‘World’s most ethical company’ by several leading corporate surveys. With friendly HR policies in place that puts ‘People First’, such as Chief Fun Officer who instills among the employees a feeling of- Thank God, it’s Monday!, IJP (Internal Job Posting) which fosters multi-functional exposure and learning along with superior recruitment policies in terms of diversity and inclusion, are one of the strongest foundations of Capgemini. Mr. Jinesh Jain then illuminated the students about the flagship offering of Capgemini which are the digital technology solutions that help other enterprises in using digital technologies so as to radically improve their performance and reach in the market. Mr. Jain also dispelled some commonplace myths about digital technology that it only facilitates the consumers and works primarily in B2C space. But, digital technology can be critical for enhancing employees’ productivity and can be leveraged to increase efficacy of a firm irrespective of its industry. He also drew the audience’s focus towards how digital transformation has changed the face of retail landscape. Be it online sales, customer reviews, transaction ease and the likes and the failure and acquisition of the previous 52% of the fortune 500 companies, digital technology has changed the rules of the game. With the rise of omni-channel purchase and online shopping, store closures and bankruptcy have reached to an all-time high with 6200 stores being closed in 2017. The chief marketing officers of firms are puzzled by this rapid disruption of technology and its complexity which makes it difficult to decide as to where to spend their money. Mr. Jain then explained the students that in this era, digital skills are a rare and valued commodity while making them understand the framework of Digital Mastery that derives a relationship between digital capability and leadership capability. By properly leveraging the potential of digital technology, firms can attain 22-31% profitability and 18% better market valuation by giving an example of Walmart, Dominos, etc. But also, this technology can be a double-edged sword as he quoted Bill Gates that people have a tendency to overestimate technology in the short term, and underestimate it in the long-term. Hence, future managers should take cues from this fact and strike a right balance between investment in digital technology as well as the benefits from its near future. 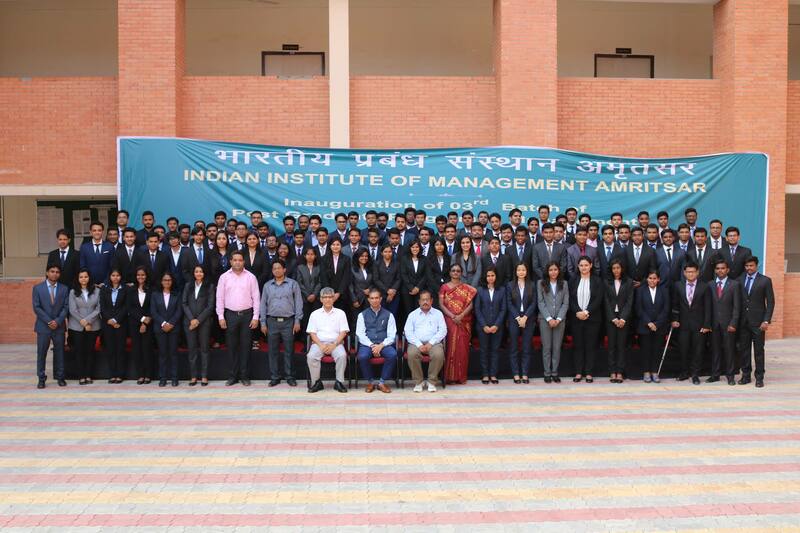 IIM Amritsar successfully organized its maiden guest lecture for the session 2018-19 and was honored to welcome its first set of speakers- Mr. Jinesh Jain (Program Manager) and Mr. Amit Godkar (Dy Manager HR) from Capgemini and for delivering an insightful session the topic ‘Digital Transformation on Consumer Business’. The session saw amazing enthusiasm and participation from both the batches- PGP03 as well as the newly joined PGP04 which is the fourth batch of the institute. The session was initiated by Mr. Amit Godkar (Dy Manager HR) who enlightened the students about the inception as well as the 50-year long journey of Capgemini, a Paris-based organization started in the year 1967 which with an acquisition of iGATE managed to enter the US market. Ever since then, the Business Applications services giant has not looked back and has scaled highest mountains with now a presence in 40 countries, with people working from 120 nationalities and revenues soaring up to 12.8 billion euros. With innovation at heart of its business processes, Capgemini is now a revered name in the field of consultancy, technology & outsourcing solutions. The organizational culture of Capgemini, he emphasized, fosters multi-cultural diversity, global thinking, out of the box problem solving, continuous learning, growth excellence, innovation, ownership, passion, collaboration and social responsibility which gives attractive incentives for the fresh talent to join. The seven core values- Honesty, Boldness, Trust, Team Spirit, Freedom, Modesty & Fun make it a wonderful workplace and these values are even commended and recognized by having given the title of- ‘World’s most ethical company’ by several leading corporate surveys. With very friendly HR policies in place such as Chief Fun Officer that instills among the employees a feeling of- Thank God it’s Monday!, IJP (Internal Job Posting) which fosters multi-functional exposure and learning along with superior recruitment policies in terms of diversity and inclusion are one of the strongest foundations of Capgemini. Mr. Jinesh Jain then illuminated the students about the flagship offering of Capgemini which helps other enterprises in using digital technologies so as to radically improve their performance and reach in the market. Mr. Jain also dispelled some common place myths about digital technology that is only facilitates the consumers and works primarily in B2C space. But, little do people know that digital technology can be critical for enhancing employees’ productivity and can leveraged to increase efficacy of a firm irrespective of its industry. He also drew the audience’s focus towards how digital transformation has changed the face of retail landscape. Be it online sales, customer reviews, transaction ease and what not, the previous 52% of the fortune 500 companies failing to realize this opportunity have either lost their game or have been acquired. With the rise of omni-channel purchase and online shopping, store closures and bankruptcy have reached to an all-time high with 6200 stores being closed in 2017. The chief marketing officers of firms are puzzled by this rapid disruption of technology and its complexity which makes it difficult to decide as to where to spend their money. Mr. Jain then explained the students that in this era, digital skills are a rare and valued commodity while making them understand the framework of Digital Mastery that derives a relationship between digital capability and leadership capability. By properly leveraging the potential of digital technology, leadership of the firms can attain 22-31% profitability and 18% better market valuation by giving an example of Walmart, Dominos, etc. He also cautioned the future managers that this technology can act as a double-edged sword by quoting Bill Gates- “People have a tendency to overestimate technology in the short term, and underestimate it in the long-term”. Hence, aspiring leaders and managers should take cues from this fact and strike a right balance between investment in digital technology as well as its tangible and intangible benefits in the near future.